HELP SAVE THE PLANET WITH BIODEGRADABLE WASTE BAGS PROUDLY MADE IN THE USA! The purr-fect solution for animal waste, cat litter disposal, household trash, and composting kitchen scraps. We are proud to offer innovative products for pets and people who also want to protect the planet! Made only from vegetable starches and resin, BioBags are the most environmentally friendly bags available today, and are believed to degrade faster than any other type of disposable bag. Using these biodegradable disposal bags allow everyone to love animals and the earth at the same time. Our T-Shirt style bags are great for large quantity dog waste pickup, cat litter scooping and cat litter disposal. Use the handles to keep your hands free of the mess when using pooper scoopers and larger litter scoops, such as the Almost Invisible Speed Scoop or Durascoop Jumbo Litter Scoop. BioBags are the perfect disposal choice when your scoop Almost Invisible Cat Litter and any other type of cat litter from your cat’s litter pan too. With weight capacity up to 12 pounds for the standard sized bags and 20 pounds for the large bags, BioBags also make terrific home and office trash can liners and bags for cat litter disposal. Each of our BioBag T-Shirt bags are certified compostable. * Please note: NEVER COMPOST PET WASTE. 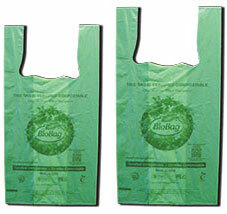 Be a part of the solution cleaning up our landfills by switching to biodegradable BioBags today! Waste placed in plastic will remain in our landfills and damage the environment for centuries. Let’s save landfill space and speed up the process while we feel good that we are lessening our environmental footprint by using BioBags in all pet and home applications. U.S. PET WASTE FACTS – DID YOU KNOW? The American Pet Products Association estimates that dogs annually produce over 4.4 BILLION pounds of waste­­­–that’s 900 football fields filled 12 inches high! There are also 96 MILLION cats producing tons of waste and tremendous quantities of cat litter that also goes to landfills daily. Your product choices DO make a difference to the future of our environment! ALSO, the majority of U.S. landfills are anaerobic (air-locked), but no worries as waste put in BioBags will completely decompose, even when deprived of oxygen.